So off we went to Goodwill. 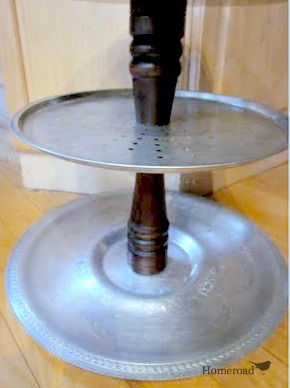 an assortment of metal trays, large, larger and huge! oh and a salt and pepper mill set. 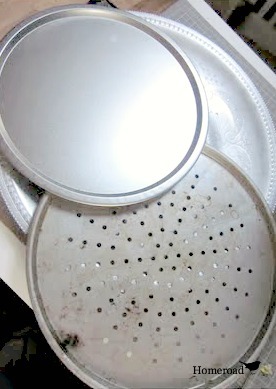 First I took apart the salt shaker and attached it to the bottom tray with screws. that went all the way up the mill to the finial. 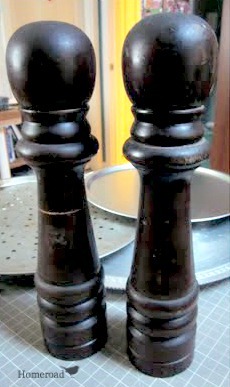 I used a saw to cut the pepper mill into several pieces and layered the other 2 trays in between. 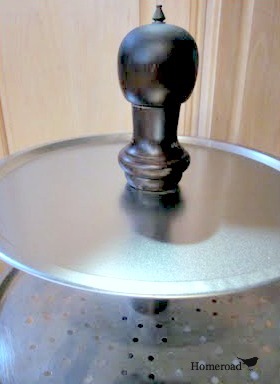 Then replaced the rod from the pepper mill, the rod went through all of the pieces and then I re-attached the top of the mill and screw the finial back on top. I added E6000 glue to add a little extra strength to the fittings. After all, this monster is almost 3' high! then added rubber legs to the bottom for stability. 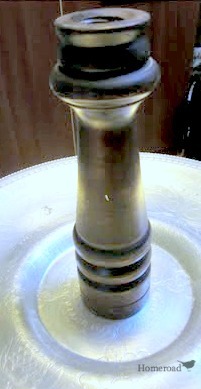 I distressed the wooden center pole and used wax to seal the finish. Now we have a neighborhood cupcake tray to share! That is sooo cute ~ what a creative idea! Love it!! What a clever idea. You did a great job. Thanks for sharing at my Sizzle into Summer party. 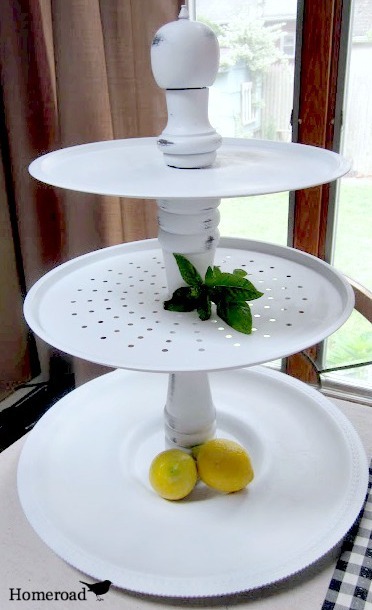 Wow, clever and inexpensive! Your cupcake server looks great. I'm sure it will be in great demand from all the neighbors. Greant and so clever! Will put that idea in my memory banks for sure! That is just the greatest idea!! You are so creative! That was great luck the rod fit through! I have passed that Good Will hundreds of times but never went in! It looks like a nice one. Have you been to the Savers in Holbrook next to Costco? I have found some good things there. 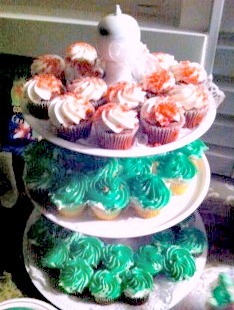 The cupcake tray came out great! If you're ever in the Chicago area, will you just stop by my house and make clever things like this with me? Haha! Thank you for sharing your creative ideas! This is another one that I am going to have to try! This is perfect as it is truly big enough to hold a lot. I love how you re-purposed the peppermill - clever. I am going to link this to my DIY Daily page on my blog - I love it. Oh, wow! Such a great idea to use the salt and pepper shakers. This is really clever. I'll be on the lookout for some trays myself. What a great idea! Your cupcake tray looks really amazing! I've seen you on the Delightful Order link party! That is awesome. I am hosting a family reunion this Labor Day and that is PERFECT!!! Thanks for the idea. 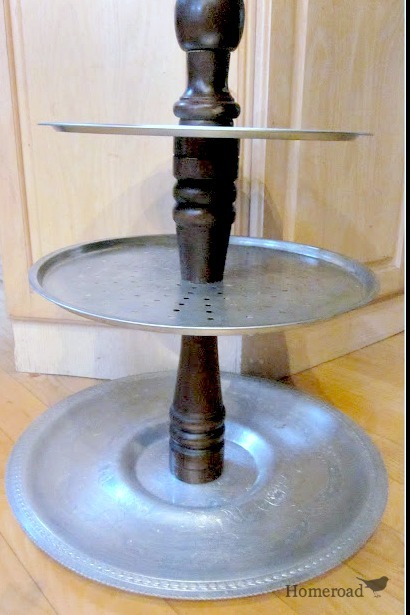 What a fab idea with the pepper shaker-you smarty pants-lol- I'm your newest follower-stop over for a visit! This is fantastic! 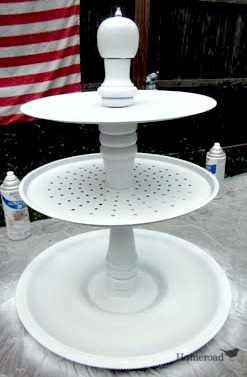 I need to do something like this for the desserts for the wedding I am baking! Thanks for sharing. 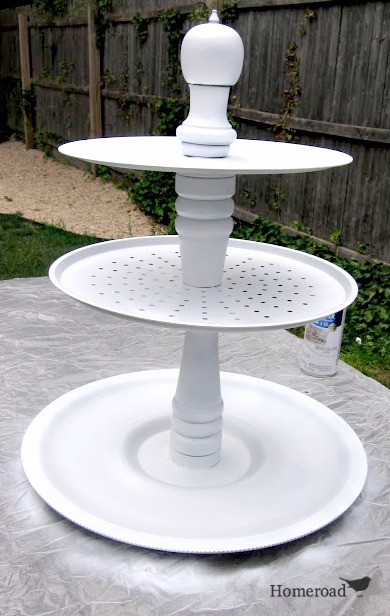 Hi Susan, I love the finished project and how great for holding cupcakes. Fabulous idea! Thanks for sharing at the Open House party. You are so cleaver and amazing! I need to make one now! Thank you for always sharing your awesome creations at my parties!! LOVE this! I featured it today at my Delightfully Inspiring Thursday party. Feel free to grab a button for your blog, if you'd like. This is so creative! You are going to get so much use out of it!